“[W]e can use the transition to 100 percent renewable energy as the vehicle to truly deliver and establish economic, social and racial justice in the United States of America,” Ocasio-Cortez said at a Tuesday panel discussion alongside Vermont Sen. Bernie Sanders and environmental activist Bill McKibben. 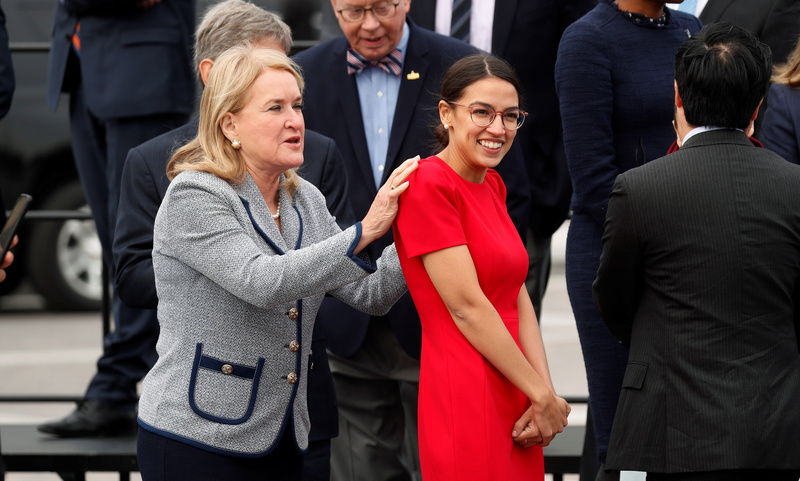 Democratic Representative-elect Sylvia Garcia puts her hands on the shoulders of Representative-elect Alexandria Ocasio-Cortez of New York as they arrive for a class photo with incoming newly elected members of the U.S. House of Representatives on Capitol Hill in Washington, U.S., November 14, 2018. REUTERS/Kevin Lamarque.